​You would think that after the summer season has passed, the busy streets and beautiful countryside hills of Italy would be silent. Quite the contrary in fact, the fall season here brings excitement with the start of the season for olio nuovo (new oil, olive oil) across the country and the season of tartufo bianco in the Langhe and Montferrat areas of the Piedmont region in northern Italy and around the cities of Alba and Asti. The fall colors of the Italian countryside are also quite the sight to see. While some green does remain, red, orange, and yellow hues are also present, creating a beautiful contrast in its landscape. Every year, as the season brings in a new harvest, they put on an Olive Oil Festa among family, friends, and neighbours. Fil was kind enough to extend an invite for me to join in on this humble and closed family affair to see the grove, eat some food, and learn a little more about what true extra virgin olive oil really is. This is quite overdue but maybe I had to go out of the country and experience other flavours to truly be able to tell you guys how special this place really is. Secret Lands Farm is a family-run sheep farm offering some of the best cheese and meat products I have tasted. And I have tasted a lot. Living in abroad in Italy for over a year, I can say that I am very familiar with detecting and recognizing good quality cheeses. And being Peruvian, I am very good at recognizing when food comes from the heart. 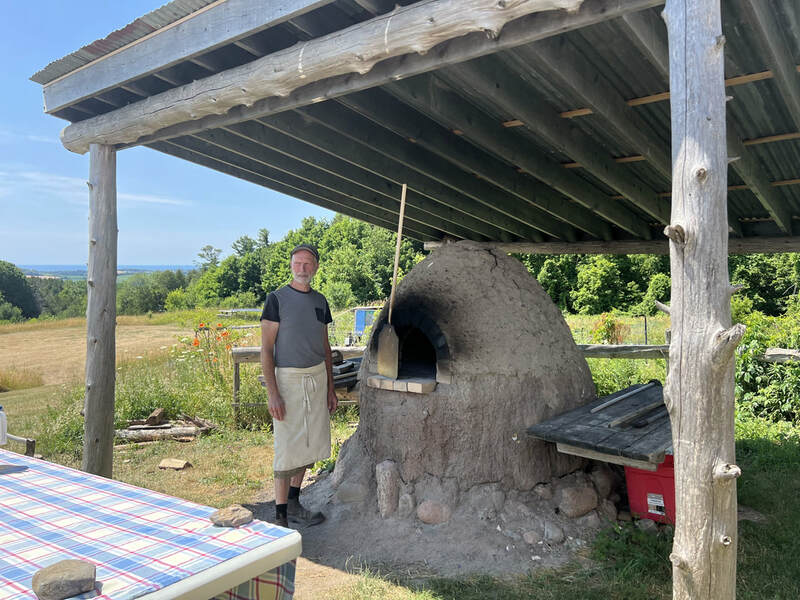 Secret Lands Farm not only produces really great quality products but also extra special products; everything that comes out of their farm and their kitchen is an act of honesty, love, and trust. The care and love that Sophie and her family put in everyday is truly special and certainty not something everyone does. You won’t taste dairy products like Sophie’s and you won’t find another café like theirs either. Let me take you through the day I had the pleasure of spending with some of the Secret Land’s Family. The cafe itself is located on the corner of Dupont and Franklin in the Junction. It’s a quaint little corner with charm. As I turned my car around Franklin Ave., I noticed it’s nice outdoor set up with chairs and tables that I am sure fill up during the hot summer days. You get a sense of character as you approach the cafe and see signs with unique messages about their products and farm propped up against its outside walls. It’s really a place of its own. It’s a cafe that wants you to come in and feel welcomed and at home and of course eat real good food. It’s a cafe that will educate you on their products. It’s a cafe that will leave a special place in your heart if you open it enough to get to know their amazing story. ​Secret Lands Farm came to be about five years ago, they were selling at farmers markets for a couple of years before starting their own store. It was only about a year ago that they opened their Secret Lands Farm Cafe. However, Sophie’s story actually starts about ten years ago when she was travelling around Europe. She was visiting Cyprus when she first tried the typical Greek cheese known as “Halloumi.” The first time she tasted it, she fell in love. *Side note: I honestly think that anyone who tries Halloumi for the first time will fall in love. I mean fried cheese? What’s not to love? In this case though, Sophie’s love and fascination ran deep. When she returned to Moscow, she could just not shake off the memory of the sheep’s milk and the cheese it could produce out of her head. And so that deep fascination for real quality and delicious cheese planted a seed in the heart and mind of Sophie, one that will later become Secret Lands Farm. For Sophie and the business trust is everything. Secret Lands Farm wants for you to trust them to make and offer you the best product possible. The quality and benefit you get from Secret Lands Farm is like no other; it’s hard to find honest and real products like the ones Sophie and her family are producing. The dairy products coming from Secret Lands Farm are based on sheep’s milk. You will find yogurt, milks, Kefir, and a variety of cheeses. 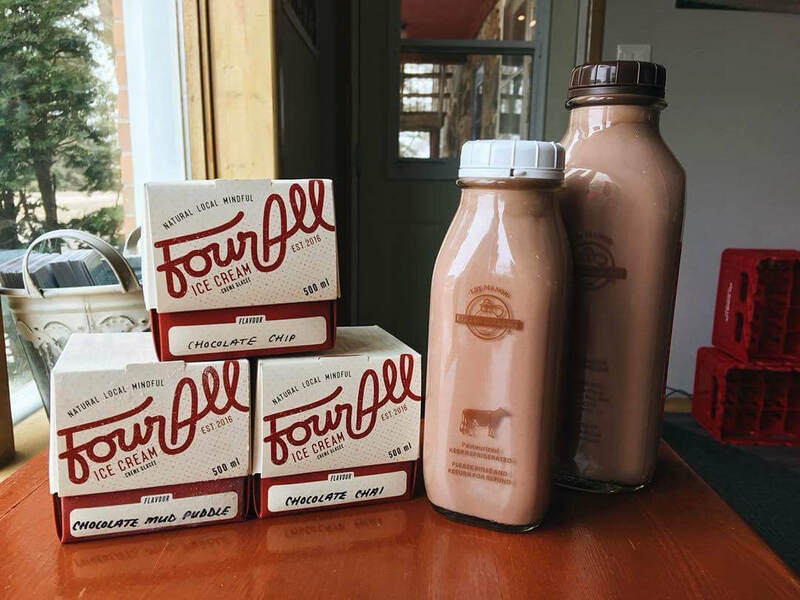 Their baked goods are also based with their Kefir, which not only adds quality to their café products but also a unique and distinct taste along with added vitamins, minerals and enzymes. “Why did you start Secret Lands Farm?,” I ask. S: We wanted to start something as our family of 3. We wanted to start something from scratch and invest in something for the future, not just ours but others as well. It was our moment and way to give back. S: Somebody may hear you. You are responsible for what you are doing as a producer and seller of goods. Don’t try, just do it, just go and produce the best product you can make. It’s obvious that Sophie’s products come with a higher price point but when you taste her products and hear her story, you understand why. Why do we pay more for certain brands of electronics or clothes? Because they are better quality and so you pay for what you get. Well the same thing applies here. Would you rather pay more for a food product that was produced with love and natural methods or one that has been commercially produced? You can also find Secret Lands Farm at various farmers markets. That’s actually where I first tried their products. I went to Trinity Bellwoods Market and a vendor stood out from the rest. He was talking about all his products and offering samples but with such excitement, I was immediately drawn to check the stand out. I got the chance to try a variety of their products from their baked yogurt, regular yogurt, Kefir, Halloumi, and other cheeses. I wanted to buy them all! They tasted so rich and natural. 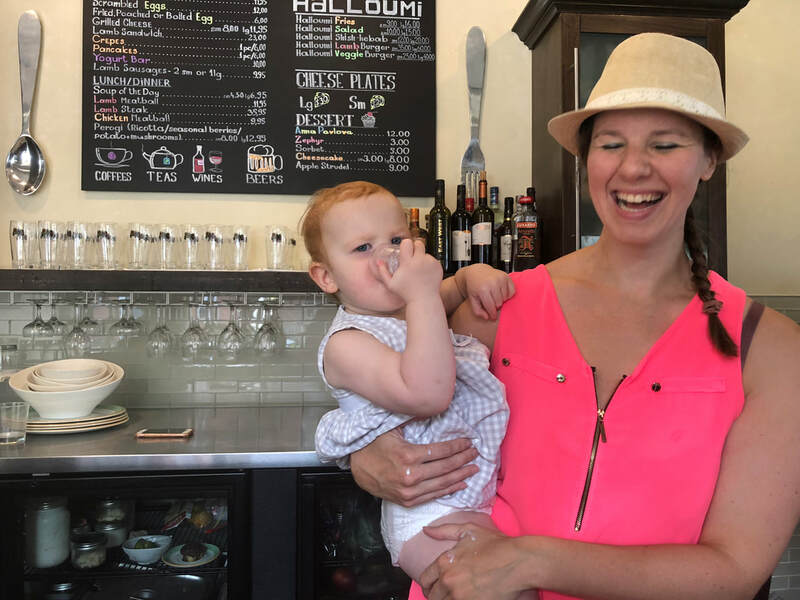 When I asked Sophie about farmers market and the role they play in their business, I was surprised to hear her answer. You know this kind of labour, labour of love, is what makes products like Sophie’s stand out. It’s also why they sell at a higher price point. You don’t pay for quantity but for quality. Here are some qualities of sheep’s milk products that I learned from Sophie and on why her Secret Lands Farm products are generally better for you. For those that don’t know, Kefir is a sour-tasting drink made from (in this case) sheep’s milk fermented with specific bacteria. Secret Lands Farm uses their sheep’s milk and adds the Kefir grains and then lets them sit at room temperature. That’s when Mother Nature runs its course, ferments until ready for consumption. Kefir has both prebiotics and probiotics. If you compare Kefir to Yogurt; yogurt helps feed good bacteria while Kefir creates good bacteria, and helps your bod clean out its system in the most natural of ways. How to drink Kefir? Is there an optimal time? You can drink Kefir at any time of the day but Sophie would recommend to just take a shot glass before each meal and at night time, before going to bed. It’s supposed to help you sleep better as it calms and relaxes your system. It’s high in magnesium and calcium so it also helps keep your bod regulated, especially if you have a quick shot glass of it in the morning. 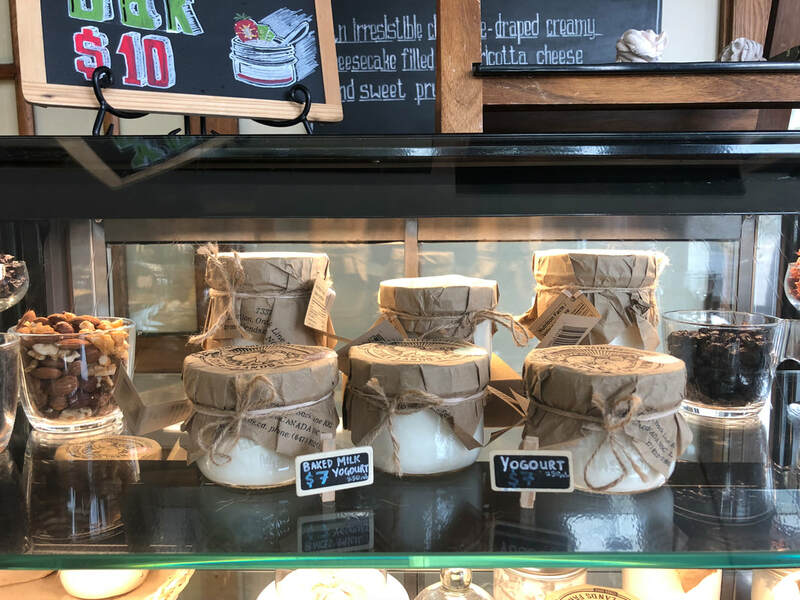 There are a variety of cheeses offered at Secret Lands Farm from young and soft cheese to old and harder ones. You can find types like Pecorino, Caciotta, Stracchino, Tomette de Bebris, Robiola, Feta, and of course Halloumi. They pasteurize their cheeses over a long time, compared to other producers. Their pasteurization is slow and at the lowest of temperatures. The whole process takes half an hour; it’s not a flash. Their cheeses are also made with some of their Kefir, which adds quality and distinctiveness to their cheeses. This means no commercial cultures, creating a more natural product. So even if you have a little “treat” at their café, it will generally be better than the things you can get a chain café or restaurant. While I was at the cafe, I was invited to taste a variety of their cheeses, dairy products, and cafe items. 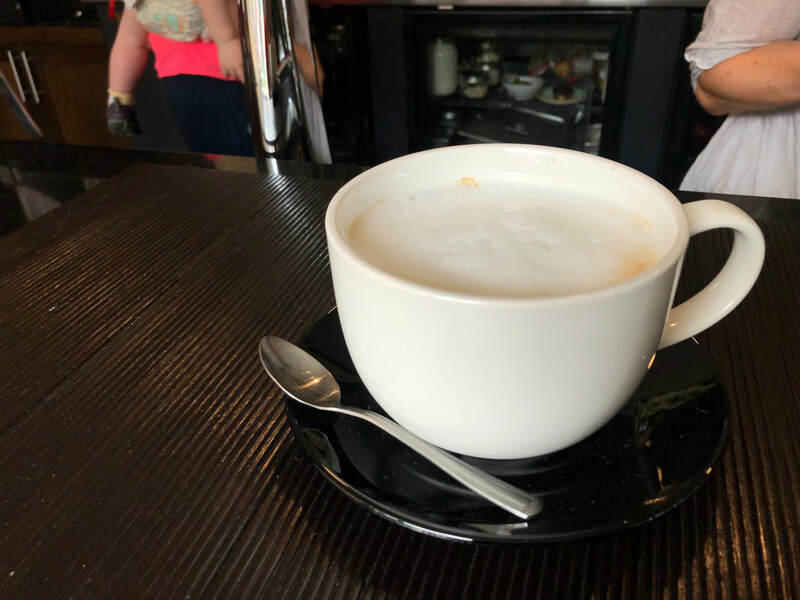 I started with the life changing sheep’s milk latte and then had a few bites of some grilled Halloumi and peaches. 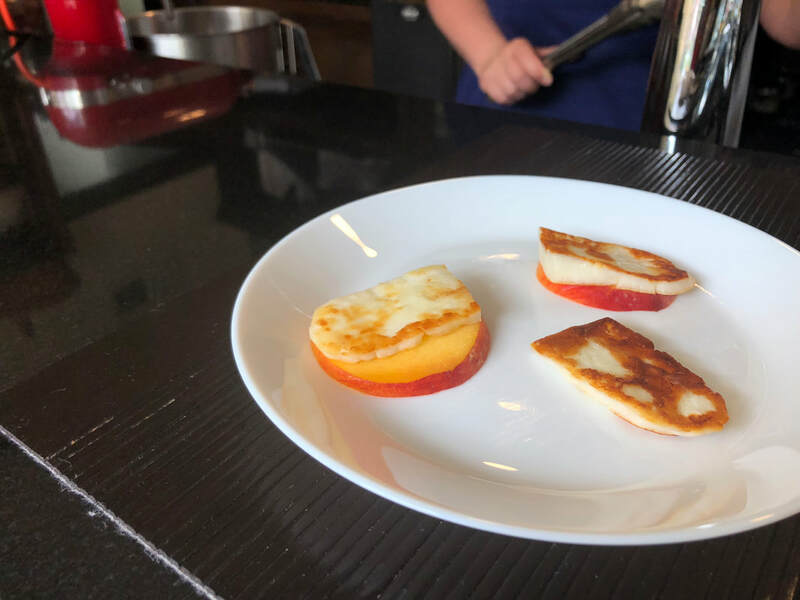 I also tried a variety of their cheeses from Pecorino (aged 3 months) to Cacciota (made from whole milk; true farmhouse milk), Tomnette de Brebis (a young cheese). They also have a wine aged pecorino (using port wine), Feta, and Robiola (which is personally a favourite). Then I had a feast! Sophie made me some amazing crepes filled with their baked yogurt and homemade wild blueberry compote sauce drizzled with local honey. Followed by some pirogies (veggie and meat based) accompanied with more yogurt, adding a refreshing twist. 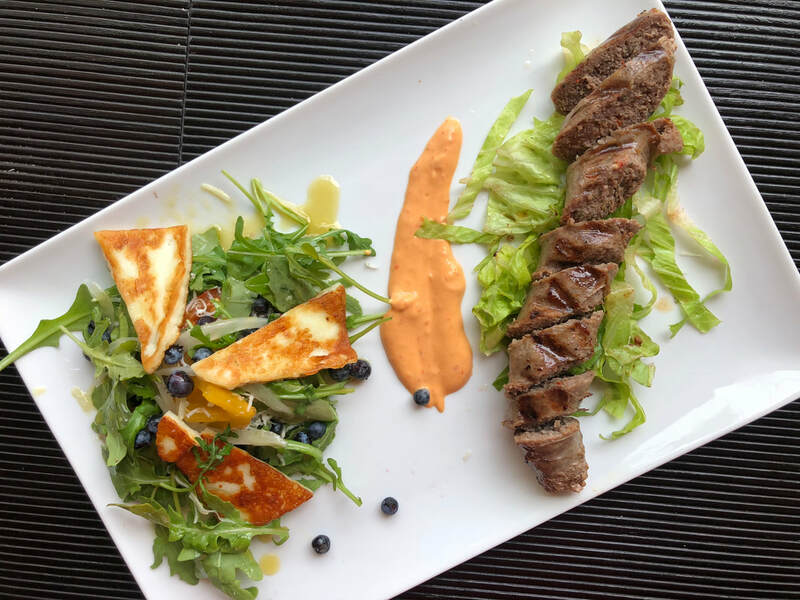 For my "last course" I was spoiled with some grilled lamb with some harissa sauce and grilled halloumi. Everything was delicious and so fresh! Such a perfect spot to grab a quick, delicious, and nutritious bite or treat. At their café, you will also find a variety of baked goods from baked ricotta savory muffins to cheesecake to even éclairs. All depends on the day, they are always changing things up and coming up with delicious treats using what’s in season and their inspiration for the day! Sophie leaves me with one final thought; this is “not for me but for you” (for us). Food is spiritual. It’s the energy of the cycle of life working together. Thus we shouldn’t disrupt this “cycle,” and we should aim to make their production process as natural as possible. That’s how we make and eat better food. I hope that I was able to give you a little look into the amazing things Sophie and her family are doing at Secret Lands Farm. I hope that you have the chance to stop by their café or at one of their farmers markets. You won’t regret it! ​I didn’t know what to expect from Sweden. I have never been to the Scandinavian and Nordic region of Europe before. It actually reminded me much of Canada, not just for the weather but its streets, transit system, and city culture. Stockholm’s food scene impressed me. There were an abundance of restaurants fit for any kind of taste, liking, and budget. If you wanted traditional Nordic and Swedish cuisine, you could get it, both at a cheap price or at a higher price ticket. However, if you looked around at where the crowds were going, you could see that a big part of their food culture also revolved around international influences like Thai Fusion, Italian, and Middle Eastern foods. I ate really good Swedish food in Sweden but also some of the best Italian and Thai food I have ever had. It’s not a fruit you hear about a lot. In fact before I stumbled across Appleflats' Crabapple Jelly, I had no idea what crabapples were, tasted like, or even looked like! But these are unique little fruits. Perhaps your grandmother may recognize them or you may vaguely remember your grandmother making crabapple jelly. Or you may be like me, born in another country, and really have zero knowledge of crabapples. But since it is never too late to learn, I decided that I wanted to dig a little deeper and get to know the story behind crabapples and how Appleflats came to be. And so began my first crabapple experience and what better way to start than to visit Appletflats’ farm and production facility, right? ​The summer is finally here and with it a whole bunch of harvests. It seems like it’s going to be a bountiful one this year. If it wasn’t by the unusual 3-week Haskap rush that indicated it, then definitely by the early zucchini and broccoli harvests. I can’t help but be inspired to use all of the fresh produce from the deliciously red and ripe strawberries to crunchy and dangerously sweet cucumbers to the plum and juicy tomatoes that are coming our way. Here’s a couple of Summer inspired recipes I’ve come up with so far and it's only the beginning! This past weekend I had a chance to be part of Taste Real’s 13th annual Local Food Fest at the Ignatius Jesuit Centre in Guelph. I spent the whole day outside meeting local vendors, participating in workshops and indulging in some of the best tastes the Guelph region had to offer! It was such a great and interactive event to attend and I am already looking forward to next year’s. In the meantime, here’s a little recap of the day in case you missed out on this amazing event. First Haskaps of the 2018 Market season from Baba Link Farms' stand at the Waterdown Market. If you are lucky, you may find this little but might berry at your farmers market. However, chances are, that you may have to travel out of your way to either the Sorauren Monday Market in Toronto or the Waterdown Saturday Market to get a taste of these rare berries. So far I have only found one person that grows and sells them in the GTA and Hamilton area. Her name is Pat Kozowyk (Baba Link Farms) and she is the only farmer I know that grows the berry variety known as The Haskap. At What’s Good Wellness, it is definitely not the latter. At their eatery, What’s Fresh Eatery, food is a part of the healing process. 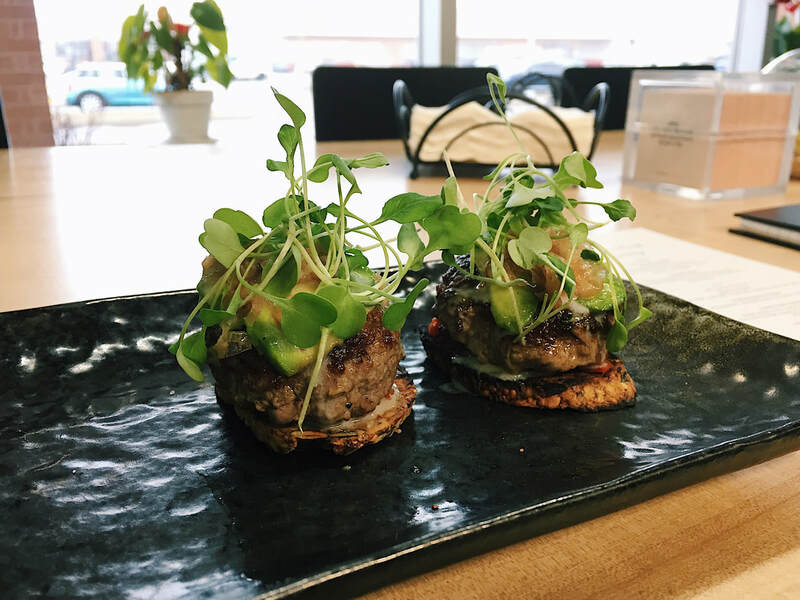 It aims to create a balance within the body of its consumer through a fusion of nutrition, mind, and body with traditional Chinese medicine, food cures, Chinese Herbal medicine and acupuncture. My visit to What’s Good was nothing short of pleasant. I spent part of the afternoon chatting with Chef Charleston about food, health, and how traditional Chinese medicine switched the way he thought about and prepared food for himself and for others. He reaffirmed in my believe that when cooking we should think about nutrition and not just taste—and that it is possible to have both. Let me tell you more about how we can use food not only to feed ourselves but to use it to restore and optimize our vitality! You guys know that I LOVE supporting local. The local businesses I support are unlike the chain stores we are so accustomed to seeing and shopping at. These local producers and vendors have a different mindset and it shows through everything they do and produce. They are not all just about the profit. They really care about realness and quality of their products! The people behind these local businesses want to make a positive mark in their community. They have big hearts and big dreams to make this world a better and tastier place! A big component for them is supporting their community by working with local producers and partnering with local vendors to provide us with the best product they can. Plus their passion for what they do and produce is unmatchable! As Earth Day approaches, there are just a couple of businesses that are shining through a little bit more in my eyes because of their waste-free and eco-friendly living mindset. This Earth Day (and whenever you can) give some love to these awesome businesses! From Tree to Table: The Snyder Maple Syrup Experience! ​Nothing like a Sunday morning enjoying some homemade pancakes with the Maple Syrup I picked up last weekend from my visit to Snyder Farms. This past weekend I had the opportunity to visit my first sugarbush. I went up to Snyder Heritage Farms in Bloomingdale, ON to witness first hand how maple syrup was made! It’s really a “tree to table” experience. The whole process happens right there on the farm. The maple trees are next to the sugar house where the sap gets transported to and then converted into syrup and packaged. You can’t get more local or real than that!